This weekend was my first time back racing in Germany since my international racing career began at the 2010 World Junior Championships in Hinterzarten, Germany. My memories of racing in Germany and that feeling I had, the thrill of representing your country and giving your all, still motivates me to work hard to this day. After nine years, this weekend I had the chance to put on a bib, this time a World Cup bib, and race a city sprint on the opposite side of Germany from where I had my international debut. The combination of the fact that it was a city sprint, I’m a big fan, and the nostalgia of racing in Germany created lots of excitement. I was really looking forward to racing and excited about the course. The rain held off and my skis felt great in warm up, I was ready to go. The qualifier was long, a two lap course. I was able to accelerate on the second lap and was happy to cross the line in 20th place, good enough to get me into the heats and my best qualification result on World Cup. I drew a heat with the overall Sprint World Cup leader Stina Nilsson. I was ranked 3rd in the heat going in, after an exciting race I crossed the line 3rd as well, not quite enough for automatic advance to the semis (top 2). Then it was time to wait and see if my time was good enough to hold up as one of the two lucky losers and put me through to the semifinals. Unfortunately the next heat was really fast and I was knocked out of a lucky loser position. I ended the day the with the fastest time of the people who didn’t advance to the semifinals, which doesn’t give me anything but is a good motivation and encouragement for next time. I ended up 16th place on the day, just one position from my best World Cup finish. My 16th place also qualifies me for the World Championships in Seefeld, Austria next month! All smiles post mid week intervals with Sophie Caldwell and Sandra Ringwald before racing in Dresden. They qualified 2nd and 5th in Dresden, thanks for letting me tag along! Speedy, speedy! This weekend’s World Cup in Dresden has been the most exciting race of my season but there have been lots of other good races too. Before Christmas I was in Canada racing domestically on the NorAm circuit. We had two weekends of racing where I came away with 3 wins, a second and a fifth place finish. That combination of results allowed me to currently be leading the NorAm overall and NorAm sprint standings. Racing to a 40 second victory at the 10km skate NorAm in Canmore mid December. Following the NorAm races I traveled to Europe right before Christmas to prepare to start the Tour de Ski along side my teammate Emily (Nishikawa). It had been 5 years since Canada had started any women in the Tour de Ski so this was a very exciting opportunity for the two of us. In order to acclimatize to the time change, Christmas was different this year. Instead of being at home with my family, I was in Davos, Switzerland with 4 of my teammates. I really missed being with my family over the holidays but we had a great group for Christmas and lots of exciting racing right afterwards. Beautiful Christmas ski conditions in Davos! Our little Christmas tree and lots of smiles on Christmas eve. The Tour de Ski is one of the most prestigious events of the season. I only participated in the first 3 stages before withdrawing to rest and prepare for the World Cup in Dresden. However, Emily completed the entire 7-stage event, which ends with the famed Alp de Cermis hill climb. Emily was inspiring and finished an awesome 25th, only the 5th Canadian women to ever complete the Tour. For me the Tour de Ski didn’t bring my best racing but it was a great opportunity. I felt a bit better in each race and by the 3rd stage a skate sprint in Val Mustair I was close to putting together a qualification worthy race. I was a couple seconds out of qualifying for the heats in Val Mustair. Regardless, I really enjoy racing there and I can’t wait to get another crack at skiing that course next year. Now that I have qualified for World Championships, the second half of the season is taking shape. The next two weekends I will be racing World Cups in Otepaa, Estonia and Ulricehamn, Sweden, before the World Championships team meets up in Switzerland for a training camp. After that we will have two more World Cup weekends before the World Championships begin February 21st. This weekend was exciting and I am happy to be progressing into the season and to have scored my first world cup points of the season. A huge thanks to my sponsors, team, family and friends for the support and a special thanks to Icycle Sports for being a big contributor to my travel over to Europe for these races. Without business like Icycle Sports supporting my travel expense and preparations, racing these events wouldn’t be possible! So much love to the entire community that’s behind me. There is still lots of racing to come this year and I am hoping that these were just the first of many good days! Little bits of Whitehorse travel all over the world with me! For those who don’t know, fellow Yukonner and Icycle Sports sponsored athlete Etienne Geoffroy-Gagnon was also competing this weekend at the slopestyle World Cup where he placed a best ever 13th. It has been really fun to see Etienne grow as an athlete and person over the years and I am excited to see what he will accomplish in the future. 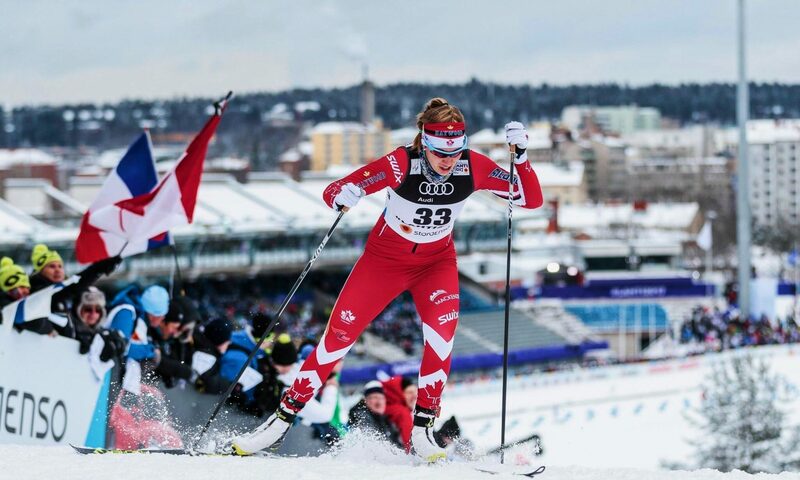 Overall January has been a good month so far for Yukon athletes on the world stage.